When it comes to traveling, especially abroad, I always pack a few musts to both prevent & treat the unexpected! 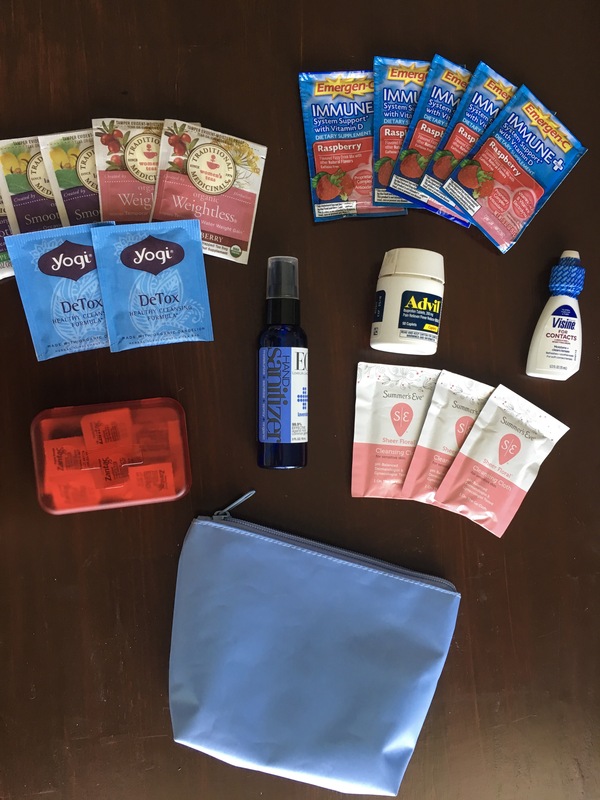 As a ER nurse I know the worst way to spend your vacation is in an ER so this blog is meant to give you a list of some simple over the counter items you can pack on your next trip to keep you feeling your best. Hand sanitizer – the number one way to prevent getting sick is to wash your hands. Sometimes that’s not always an option so having hand sanitizer easily available before you put your hands on a delicious sandwich or tapas is one of the easiest & most effective things you can do. I like taking a hand sanitizer with a mist spray that way the first thing I can do when I board a flight is to spray down my tray table, seatbelt, armrests etcetera. I know this may sound crazy OCD but those planes A: don’t get cleaned after each flight & B: sick people fly all the time. So if the person before you had a nasty head cold you’ll be picking up all those germs. Emergen-C – These little individual powder packets are a great way to also keep your immune system up. Pour one into that little airline cup of water they bring you & you’ll thank yourself. Side note: they also make for great hangover prevention if you drink one or two the before you crawl into bed (tried & true)! Visine / Eye Drops – Nothing dries your eyes out more than recycled airplane air. I usually opt for glasses over contacts, especially for long flights, but putting a few drops of Visine in your eyes intermittently or before you pop your contacts in can make you feel like a new person! Ibuprofen – The cure-all. I never go anywhere without it. Headache / back ache / hangover you name it. 600mg & you’ll feel right as rain. Tea – I was never a huge tea drinker until a few years ago & now this is something that I pack with me when I travel. I pack a handful of different teas, they’re small and compact so even if I don’t drink them all it’s no big deal. Not to mention airplanes are typically freezing so drinking something nice & warm that isn’t coffee can be really nice. Air travel can make your body hold onto excess water so I like to pack Weightless Tea which helps relieve excess water. Along those lines a nice Detox Tea is good to have on hand. Often when we travel we’re eating & drinking things that we may not normally which can then in turn impede on our normal routine so Smooth Move Tea can help if you find yourself struggling to adjust to new cuisine. 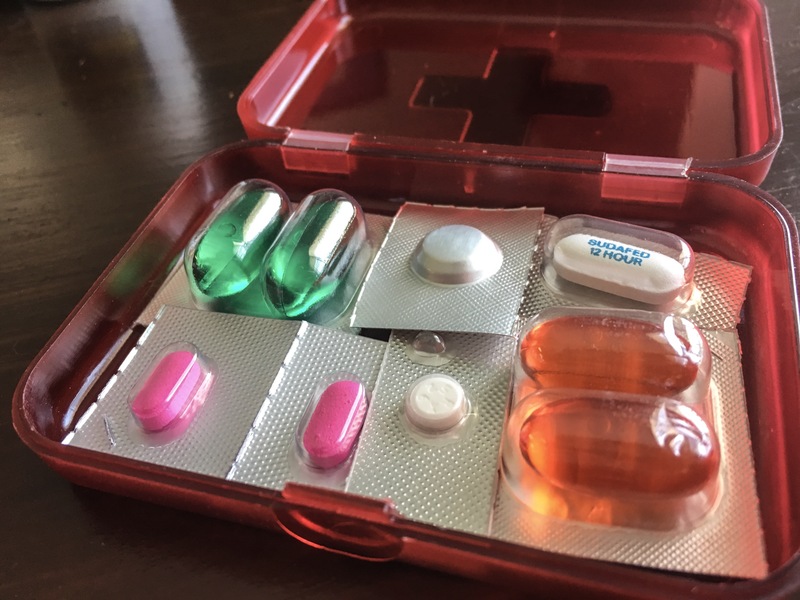 Medicine Kit – What kind of nurse would I be if I didn’t have a little mary poppins-esque medicine kit for all the ailments. In here I put individually enclosed doses of: DayQuil / NiQuil, Benadryl, Non-Drowsy Allergy medicine (loratidine), Zantac for heartburn, & Sudafed. I don’t pack tons of these meds but enough for 1 or 2 doses. And someone non medical might read this & think it’s excessive, but I will say that I usually use something out of this box per trip & it’s cheaper / easier to just bring it ahead of time. As an aside (in most states it’s illegal to have unidentified pills, so make sure they’re individually wrapped & marked with what medication it is, otherwise you may find yourself having to do some explaining to a TSA perosn). I found the little medicine box in the Dollar Spot at Target & just grabbed a couple. Fem Wipes – These are great to have on hand just in case. You never know when you might find yourself in a restroom that’s out of toilet paper or when you may need a quick refresh. These are small & easy to stoy in a little pouch. Like most things on this list it’s easily packable & better to have than to be frantically trying to find an alternative. A must that I take with me on all trips but I didn’t include on this list because a prescirption is needed is a small course of antibiotics. I’ve found myself across the country with a UTI trying to find a pharmacy while in terrible pain & discomfort. Definitely a less than ideal situation. Most doctors are willing to write a prescription for this just in case scenario. I just talk to my doctor before I leave on a trip. Again, it’s far easier to reach in your bag & have what you need then be scrambling & feeling terrible.